Every polish fanatic has their wish list. And I'm sure that on every wish list is at least one illusive item or brand. For me, "The Illusive" is the brand Nfu-Oh. Oh yes, yes can find it on websites selling it for $13 a bottle or more, but really... could you not have a professional USA distributor? If anyone out there knows of one, please let me know. Until then i'll be cruising Nfu-oh's "product catalog" blog, wishing that I could have it all. Or at least wishing I could have their products at the usual discounted prices that professionals are use to having. Anyway, I caved and bought one Nfu-oh polish #051. I promise when I get it in the mail, I'll do a swatch to show you how pretty it is. Kind of reminds me of the other "illusive" Clarins 230 aka unicorn pee. No joke, people really refer to it as unicorn pee. Anyway Clarins 230 is a whole other story seeing as its discontinued and selling on ebay for a minimum of $60 a bottle. Here's a quick pick of Nfu-Oh 051 to get me back on track! For those of you who have never heard of Nfu-Oh, its a Korean based company founded by Enfu Oh in 1996. 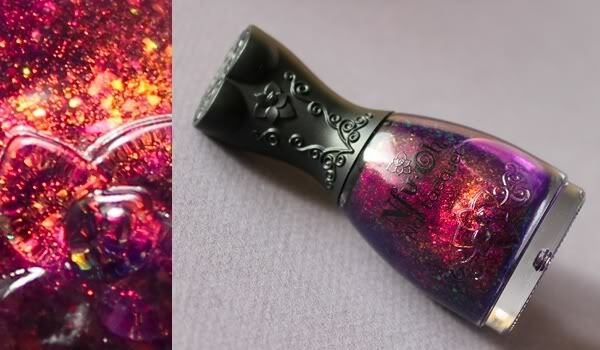 Nfu-Oh is known to have amazing shades, and of course, the amazingly cute corset-shaped polish bottle. Cause seriously... who doesn't want to polish their nails with a corset? Other than that though this company is a bit of a mystery, at least their website makes it seem so. They're coming out with a UV polish line just like everyone else is, they have an acrylic system, and I know they have an education program in Korea... but that is about all I can get from their website. There is a forum though for information. According to forum, Nfu Oh is manufactured in France and does not contain Formaldehyde, Dibutyl Phthalate (DBP) , Toluene, Formaldehyde Resin and Camphor. Beautiful and environmentally aware. Of course I'm going to want that. My only issue: they don't come up with nifty little names for their polish colors, just numbers. What fun is that? Anyway, here's another picture so you get an idea of their beautiful colors. 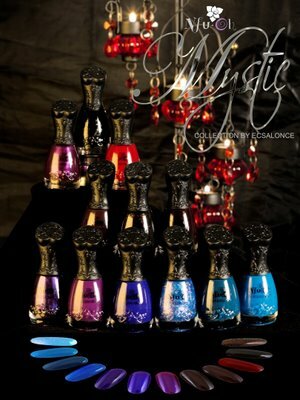 This is the Mystic collection. So now you know mine. What is your illusive wish? **Update** www.fabuloustreet.com does indeed provide a professional discount - but you have to email them? Its in their Q&A section. They also provide info if you want to become a US retailer. A bit weird, but good to know... after I placed my order lol.